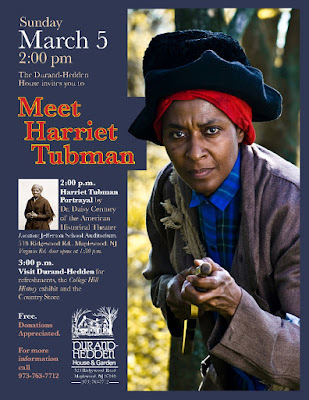 Meet American Heroine Harriet Tubman at Jefferson School, Maplewood - March 5, 2017 ~ The History Girl! “I was the conductor of the Underground Railroad for eight years, and I can say what most conductors can't say — I never ran my train off the track and I never lost a passenger,” said Harriet Tubman in 1896. Ms. Tubman’s story – as an enslaved person who escaped and became an abolitionist, humanitarian, and armed Union scout and spy during the Civil War – is an American legend. But what was this American icon really like? In honor of Women’s History Month, the Durand-Hedden House presents inspiring actress and educator Dr. Daisy Century of the American Historical Theater who will bring this remarkable woman to life through her vivid historical interpretation. Harriet Tubman is a role model for Dr. Century, someone who encouraged her to put others first and to lead by example. Like her inspiration, Dr. Century grew up on a farm, has a wonderful singing voice, and is a determined woman of conviction. A naturally talented teacher and actor with a PhD in Science Education, she couples scientific methods with creative imagination to make her historical portrayals thoroughly researched and dramatically intense. This entertaining and educational event will take place in the Jefferson School auditorium (518 Ridgewood Road, Maplewood, NJ) directly across the street from the Durand-Hedden House (523 Ridgewood Road, Maplewood, NJ). The door on the Virginia Road side of the school will open at 1:30 pm and the presentation will begin at 2:00 pm. Afterwards, light refreshments will be served at Durand-Hedden. The Country Store will be open until 5:00 pm, offering hard-to-find books, posters, toys, decorative items and maps that people have come to love. The exhibit on the history of the College Hill neighborhood, From Farm to Suburb: The Birth of College Hill. which explores the evolution of a section of Maplewood from a dairy farm to a popular neighborhood of 300 houses, will also be on view at the House.